This topic contains 52 replies, has 19 voices, and was last updated by giuspen 2 months ago. Soooo, what is the status right now? I’ve been checking lots of new software for Windows/Macs/Android form tree apps to research IDEs to mindmaps to editors etc etc. for the last few years, about over three hundred. Most, over 90%, did not make the cut for me. Integrating the best of each genre in the chain into my overall process for the last few years. And recently in the last few months I have been checking well over fifty new software and a few of them made it into my process chain. These are specific genres, outlines, mindmaps, Tree, comparison, end package IDE type heavy platforms, 2publish formatters, Android apps, Note takers, etc etc etc. 3) It has Zero export ability for Tree Type files & conventions. It’s own propriety files are not exports, just like any other software. This basically means it is deterministically a dead-end. It is it’s own end product. Further it’s Tree structure, it’s own essence and raison d’être, means it can not be used in any chain process unless it is the end node. Basically it means it is dead in that sense. * OPML: The basic format of this for Tree type structure is probably the best option. Though it is best to stick to basic forms of OPML as there are many variations which become complex like XML. One of the last 3, (basic tree) OPML or MD or XML, is the best way to give Tree type export in a single file and make CherryTree come alive as a node in a chain of software packages as used by most professional data/knowledge users. I would say basic OPML Tree output is probably best and easiest with most exposure across many software packages. This reply was modified 1 year, 5 months ago by washere. In last paragraph I meant OTL (Natara Bonsai) outline format not XML, as I correctly said “One of the last 3”. In fact XML is the worst option as there are near infinite definitions and is the worst IMHO for import/export, in my experience only about 10% of XML tree exports import into another software. I could not import CherryTree XML, even after using DB converters and editing sample XML files, into any of the many nodes in my ToolChain softwares. Bonsai blog is still up and there are rumors he might pick it up again. It is still a solid format for tree import/export used by many. MD MarkDown tree format is second best, imports into many. OPML is still the best tree export but one has to keep to the basic format as in XML there are many propriety complex OPML fornmats that do not interchange across softwares. Basic OPML does import into most genres of softwares too. Any of the last 3 is OK, XML is the worst. @philippHRO the status is I’m working in rebuilding and integrating p7zip becase the password protection is lame and I would like to make it right. After this I’ll continue with the porting to C++/gtk3. After my newborn son Lorenzo (now about 1 month and half old) I had very limited free time but I’ll try to keep up how much I can. This reply was modified 1 year, 5 months ago by giuspen. Thank you for devoting your free time to this project. I use CherryTree every day at work, and I also have another Tree on my private laptop. It’s really a great piece of software, that keeps getting better. I guess I am also building a tool chain with CherryTree as a link in my chain. So the most vital point now is for it to have a widely used Tree type EXPORT filetype convention. I have looked at various parsers to analyse CherryTree output format (ctd) so that it can be piped to other tools in the “tool chain”. Congrats to @dev on his new son Lorenzo. All the best wishes for him and family. Eureka is right about pandoc. It is actually used by many devs in their software under the bonnet. Also there are quite a few GUI interfaces for it. Being an ex-coder, I never used gui fronts for it, I use it occasionally noramally command inline. Tip: to open a DOS box in any folder fast: hold shift key & right-click to get in menu “open command box here”, opens in that path. But pandoc is in my path so can convert with it from anywhere. I think the dev is well aware of pandoc. He just has a huge list in his todo and not enough time. I’m using MS Visual Studio Code less these days for basic txt/code, third fave, Atom is firmly number two and might topple Sublime-Text from top position. I use many genres of software with android putliners/mindmaps/note takers at bottom to tree editors like CT somewhere in lower middle to dedicated outliners to Script writers like Scrivener to foontnte IDE/Knowledge base like Zotero/Citavi to packaging for publish ebook and more. Depending on each type of project and size. I like the CT interface but currently am using NoteCase Pro (Windows version) as it lets me export higher up in toolchain. The only way currently is to export all CT tree as multi text files, import their folder into NoteCase Pro and export to OPML MD etc etc. But CT export leaves all subnodes as root level nodes. However the prefix — is added for each subnode level (more if lower down) as well as parent node name. So I drag them (or shortcut key) to move them into their parent node in NoteCase Pro. That is how I got my old CT trees into NoteCase and then exported as OPML into my toolchain (not my invented word btw) higher up into bigger software packages. Fortunately most take in OPML. I also recommend downloading Typora (Windows version) which is free. It is basically an MD or MarkDown editor, I use a few other MD editors (split screen to see output vs. code) too. MD format will be huge in near future imho for editing layout format. OPML will be standard for import/export. XML almost never works across software. I use MD sometimes if an app does not have OPML. Actually for import/export my most used tool is Bonsai Natara. Secondly the legendary now abandoned Bonsai has export template files called .oxt which I edit and customize. Those interested in these tree genre wares, search bonsai chm help file for customized export and see the specs. I set up NoteCase Pro with black theme like my CherryTree interface and using it in that slot. In other slots of my tool chain there are about 15 to 20 faves of different genres, out of hundreds tested (ongoing tests) which are called upon when needed. IIRC I saw OPML somewhere on dev’s todo list but porting onto C++/gtk3 will take a huge time so I’m not holding my breath. But will check to see status of development and changelogs for CT regularly to see what is happening. Thanks @washere for congrats, you’re right I’m short of free time at the moment, furthermore in urgent need to complete the porting to gtkmm3. Are there any plans in the development pipeline to bridge between CherryTree and TEI format (Text Encoding Initiative)? Here is an overview of TEI ..
@eureka at the moment I cannot talk about any new feature, just bug fixes and pointing to the new library. After further testing a line can be drawn to use CherryTree without adding new features. The earlier discussion about using pandoc in a toolchain applies. For example CherryTree can export HTML and pandoc can convert HTML to TEI-Simple. I just saw the latest update and installed. CherryTree is in essence an Outliner Tree editor (nodes & sub-nodes levels). But it does not export as hierarchical nodes/sub-nodes single Outliner Tree file. It’s own ctd propriety xml file is only read by itself. 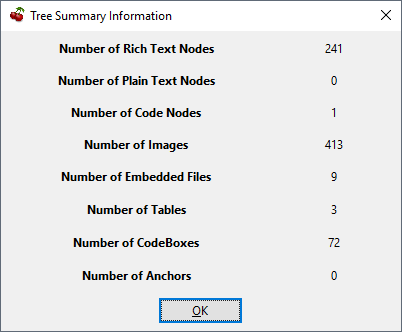 The other few exports in pdf or html or txt are either single flat (not Outlined tree nodes/sub-nodes) or multi flat files for each node of the tree. To end this dead-end status, I wrote some procedures and codes to convert cherrytree file to a single OPML outline file, which can be read by many other softwares. Hence breaking the current dead-end for this wonderful note taking tool. However it needs more work, I might have some time over the holidays to finish and polish, hopefully. That’s it! I can already convert CT files to this OPML single outline tree file, just need to fine tune and fully automate as opposed to using other programs too. I hope I get the time. Anyway, thanks to dev for the latest rich format and paste features etc, much appreciated. This reply was modified 1 year, 4 months ago by washere. Thanks to the whole equipment for his effort. I think Giuspen is busy taking care of his family. I think we should let him catch his breath and develop at his own pace (which he has done extremely well so far) and avoid bombing him with requests of all sorts. I hope all is well with Giuspen and his close ones. True, but the last time we heard from Giuseppe was on 2 Dec, i.e. 5 months ago. So if he is busy with the family or other things surely it would not be asking too much for him to just let us know that all is fine and when he expects to start working on CT again. Or are we to assume, Sisyfos, that he has asked you to reply to these kinds of enquiries? This reply was modified 11 months, 3 weeks ago by Klaas Vaak.